Efficiency and perfection in a single machine! Tilling can now be performed quickly and easily and a high yield per hectare achieved. 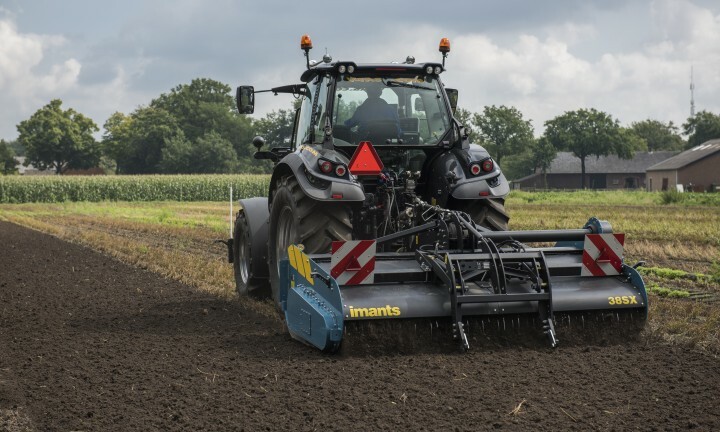 Imants has designed a spading machine that can compete in all areas with other kinds of tilling on sand and light to loam to loess-like soils. The 38SX spading machine makes spading achievable for everyone. The new design of the current generation of spading machines is also implemented on the 38SX series. The 38SX series combines the spading of the 37SX series with the latest techniques.The spade shaft is driven on one side by a very strong duplex chain. The machine is suitable for tractors up to 150 HP.The 38SX carries out the primary tillage using the spade shaft. There are seven banks on the spade shaft, each with four spade brackets, two left and two right. The unique design of the Imants spade brackets ensures good mixing, flow of organic material and even tilling of the soil to the desired depth.There is a crumbler roller behind the spade shaft. The crumbler roller is a driven roller with hardened spring tines mounted on it. The crumbler roller on the 38SX is slightly larger (406 mm). This is ideal if the soil in not stable enough or if heavy machines are used. 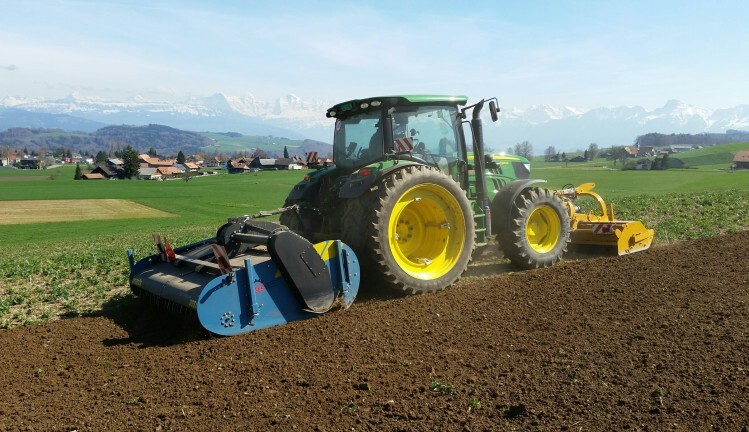 Its special design makes the crumbler roller suitable for a perfectly pressed seed bed, levelling and additional incorporation of organic material in the topsoil, for example. All Imants spading machines are PTO driven and are carried on the 3-point hitch. The machine lowers by means of the hitch until the crumbler roller supports a large part of the machine. The working depth is then adjusted using the position adjuster on the tractor. The 38SX is built for a maximum speed of 4.5 km/h. At that speed, the spading machine turns at 900 rpm on the PTO and therefore uses far less fuel. Because of upscaling and the continual increase in fuel prices, it is important to choose a machine with high capacity and low fuel consumption. Imants combines these factors in its spaders so the soil can be worked in an attractive and smooth manner. Spading is a separate method of primary tillage. Spading tills the soil intensively without losing its structure. The soil is turned by the spade shaft and thoroughly mixed. The organic material is mixed with the most biologically active, oxygen-rich topsoil. Stubble, residue, stable manure, compost, green manure and even maize straw can easily be incorporated well in a single process. This means the organic matter becomes available immediately as food for micro-organisms. There is no plough pan because of the unique way the spades are inserted. The result is better water management, while fertilisers and minerals are better used. Because the spade shaft pushes “forwards”, less tractive force is needed compared to ploughing. The tractor travels on the topsoil, not in it. The spading machine removes all compressed soil to create the perfect seed bed without clumping. And the fuel consumption per hectare is lower! Combining processes offers even more advantages.The productivity per hour with tractor and driver increases and one or more processes become unnecessary. In addition, there is no structural damage because you can sow directly into the seed bed. Combining processes can save on fuel, manures and even tractors. The 38SX was designed with the concept of attaching other machines in mind. The flat design offers more options for a three-point hitch or the attachment of a seeder. This allows you to combine intensive/deeper tilling with a seed bed and direct sowing. The 38SX is especially suitable for combining with the Imants Culter. This subsoiler (attachment) was developed specially for combination with a spading machine, and the 38SX is an ideal partner because of its speed and weight. The machines form a unique team for creating “fault lines” in the subsoil and for working the topsoil intensively to make an immediate seed bed. The 38SX also works perfectly when combined with a front flail mower. Maize straw, green manure and stubble are broken down even better. The spader can then mix it in well and when combined with a seeder, everything is ready in one go.